33.5 weeks. 6.5 weeks to go. Last week was a rough one. Not everything about pregnancy is glitter and sprinkles, and I was definitely feeling that last week. My body is getting sore, I’m not sleeping the best (heartburn and bathroom breaks), and it’s becoming more challenging to get comfortable. I’m not constantly UNcomfortable, it just takes more of an effort to get in a comfortable position. When I have been sitting for more than 3 seconds, it takes longer than usual to get up and moving. My fingers are like sausages, and my feet are pudgy. I knew all of these things would come, I really did. But all of a sudden this last week, I was completely overwhelmed by all of it. On Wednesday, I honestly found myself thinking, “Can I do this for 7 more weeks?” And then I got really scared that I was having those thoughts. On Monday, I got an email that the dresser/changing table that we ordered in the middle of February was out of stock and isn’t going to be delivered until THE BEGINNING OF AUGUST. Let me remind you right now that my due date is May 28. I’m sure you can guess where this is going. Before I go on, I KNOW that everything will be alright. I KNOW that we don’t NEED a dresser/changing table. But, as I’ve mentioned before, I am a planner. I like to have my ducks in a row. I had a vision of a complete nursery with things on the walls and onesies in the drawers that was going to be JUST PERFECT for our little baby when we came home from the hospital. And with one email, I felt like all of that got taken away from me. I suddenly felt like the few things that I can control – decorating a nursery for one – got taken away from me because of unforeseen circumstances. And that led to a complete meltdown. Now, I have had meltdowns before. But this was different. I think that it was a minor panic attack. All of a sudden I was just completely overwhelmed and feeling like we are going to be utterly unprepared for this baby to come. And then, I was terrified. Wednesday night over dinner (the same day that I was starting to wonder if I could handle 7 more weeks of pregnancy), I decided to try to talk to Peter about it. It was really hard for me to put into words what I was feeling, and he sat and listened to me stammer and stutter try to express my fears and panic. And I did what any hormonal, emotional, first-time pregnant lady would do. I got mad. I got REALLY mad. In less than half a second, my tears went from sad and scared to hot and angry. And then I got even madder because I was so annoyed with myself for being so mad at Peter, who didn’t do anything wrong. Pete, who didn’t know that I was getting so mad, kept reassuring me that we would be ok. I got up from the kitchen table, and started cleaning my dinner plate off in the sink, saying “Never mind. I know it’s stupid. I wish I wouldn’t have said anything.” He kept talking, soothing, encouraging. I slammed my dinner plate into the sink and yelled through hot tears, “PETER. PLEASE.” And he just stared at me, confused and hurt. I started crying harder and walked away. As I was walking down the hallway, the light was on in the baby’s room. Looking into the baby’s room to turn off the light, I started feeling short of breath and panicky. I turned off the light and shut the door – a door that hadn’t been shut since early January when the room was painted – because that room was just one big, fat reminder of how unprepared I was to have a baby. Needing to close that door was horrifying. At almost the flip of a switch, my favorite room in the house, the room that I could stand in for hours, was a room that I couldn’t even look at. I cried in our room for a while, and then Pete came in. I looked at him and said, “I don’t want to talk about it.” He said that was fine, gave me a hug, and left me alone. You guys, it was such a sad night. I was feeling so sorry for myself, and I was still panicky that we weren’t ready to have a baby, but ready or not, baby is coming. I slept horribly, and still wasn’t ready to talk about anything the next morning as Peter and I were getting ready for work. The entire day after my little attack, I was in a weird mood and couldn’t even think about the night before without getting teared up and short of breath. Finally, after work that day, I was able to apologize to Peter for being so neurotic. The whole thing of my meltdown was that I was SO ANNOYED with myself. Because I KNOW that everything will be fine. I KNOW that we will be alright. It was a very frustrating experience all around. Yesterday, the gliding chair came. I opened up the baby’s room door again and opened the window to let in the cool breeze. Pete put the glider together as I cleaned the kitchen, wondering if I would be able to sit in the chair after it was assembled. After three days of weirdness and getting over my panic, I am feeling pretty back to normal. More excited than scared. And I’m glad that I feel like that again. Because the panic, it’s just not me. ANYWAYS. That was heavy! 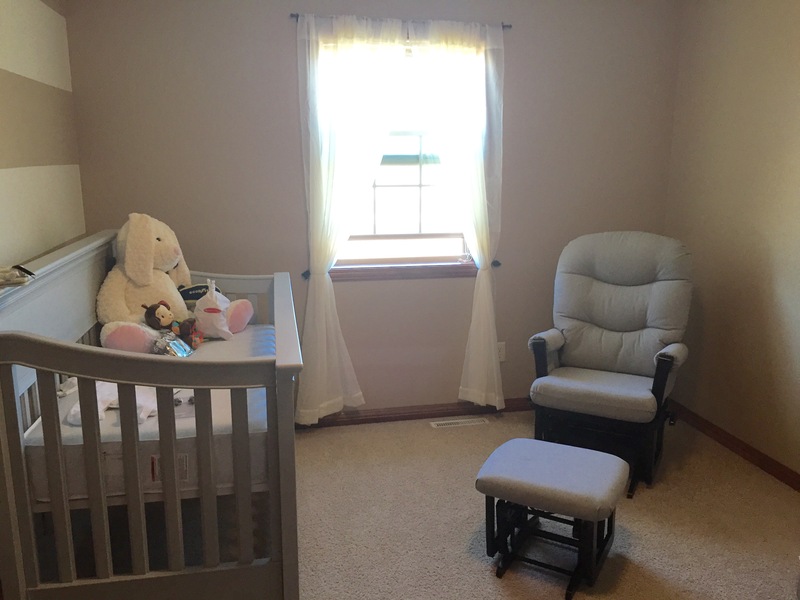 Let’s get happy again and look at how nice the new glider looks in the nursery! The glider really is just perfect for snuggling a brand new baby. I’m smiling just thinking about it. PS: Writing this post, I’m realizing what an impact dressers have had on my life. Remember when we bought a house, and it all started with a dresser?? I’m going to ban any more dresser talk from now until eternity.